Yesterday I cam across an article referring to a publication in Nature Communications in which an Australian research group published a new method for direct transformation of CO2 into carbon. The technology is still in a research phase, but if workable on bigger scale it has high promises for a sustainable future. Solving two issues in one go: reduction of CO2 in the atmosphere and reduction of the chopping of wood for transformation into various kinds of carbon. I can imagine a wide range of applications ranging from drawing charcoal to active carbon, from BBQ charcoal to building block for carbon rich fuel. 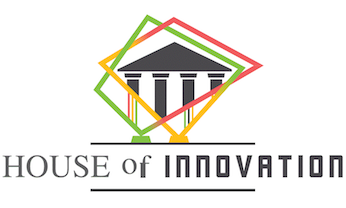 If you feel the same and have interest in further exploring business opportunities for this process, please leave your reaction hereunder, or contact me directly. 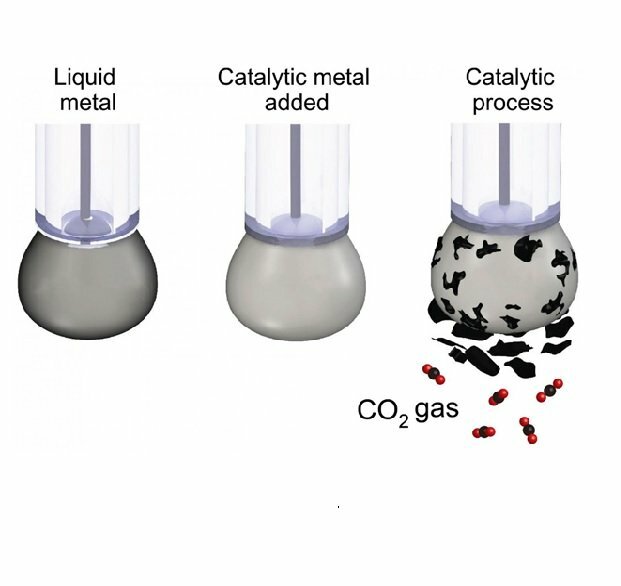 In what is claimed to be a world first, researchers have used a liquid metal catalyst to turn CO2 back into solid coal, an advance with implications for carbon capture and storage. Published in Nature Communications, the research led by RMIT University in Melbourne, Australia is claimed to offer an alternative direction for safely and permanently removing the greenhouse gas from the atmosphere. 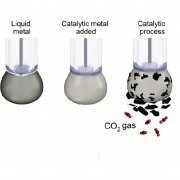 Technologies for carbon capture and storage (CCS) involve compressing CO2 into a liquid form, transporting it to a suitable site and injecting it underground but implementation has been hampered by engineering challenges, economic viability and environmental concerns about possible leaks from the storage sites. “While we can’t literally turn back time, turning carbon dioxide back into coal and burying it back in the ground is a bit like rewinding the emissions clock,” said Daeneke, an Australian Research Council DECRA Fellow. According to RMIT, the carbon dioxide is dissolved in a beaker filled with an electrolyte liquid and a small amount of the liquid metal, which is then charged with an electrical current. The research was conducted at RMIT’s MicroNano Research Facility and the RMIT Microscopy and Microanalysis Facility. The collaboration involved researchers from Germany (University of Munster), China (Nanjing University of Aeronautics and Astronautics), the US (North Carolina State University) and Australia (UNSW, University of Wollongong, Monash University, QUT).